↑ ASEAN Charter. 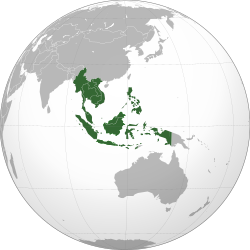 Association of Southeast Asian Nations. pp. 29. http://www.asean.org/archive/publications/ASEAN-Charter.pdf. "Article 34. The working language of ASEAN shall be English." ↑ ५.० ५.१ ५.२ ५.३ ASEAN Community in Figures (ACIF) 2013 (6th संस्करण). Jakarta: ASEAN. Feb 2014. प॰ 1. आइएसबिएन 978-602-7643-73-4. http://www.asean.org/images/resources/2014/May/2.%20Feb%202014%20-%20ASEAN%20Community%20in%20Figures%202013.pdf. अन्तिम पहुँच तिथि: 9 May 2015.